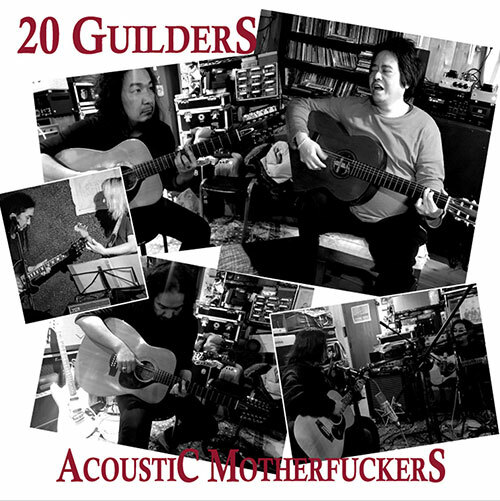 20 Guilders have always felt like they grew out of a mutual love and deep respect for rock by both Junzo Suzuki and Tabata Mitsuru. A raw and at times blurred journey through a world constructed from the vast banks of vinyl both live with. Elements of pysch, rock, folk, pop, avant twists and buzzing fragments filtered through a heaving present day Toyko underground. New Songs & Wrong Songs For Particia (2011) played out like slow burning drift of folk shone through a woozy filter. The unassumingly titled 2 (2017) plays out like some lost multi-headed 70’s pysch rock masterpiece. II Grande Silenzio (2018) was a step towards a form of introspective space rock. I remember talking to Junzo during a tour of the UK a few years ago and we discussed the idea of exoticism. Whilst many of the fundamental things I love about Japanese music is its completely alien nature, its form, its textures, the language itself, a sense of somehow going further than others to create something westerners like myself often regard as the ingredients for ‘extreme Japanese music’. Junzo suggested, that for him, the ideas that forms like British traditional folk music, songs that talk of wintry lanes, moorland mysticism and traditions were every bit as alien and exotic to him as Japan was to me. So in a way, the directness of the title Acoustic Motherfuckers playing with the notion that somehow they’ve twisted this live in the studio set as some form of sonic assault. In fact the title and sleeve are homages to the Rolling Stones much celebrated bootleg. Acoustic versions of music that were originally conceived as electric certainly sheds a different light on familiar forms. The playing and the players are more exposed and momentum only ever a few second from silence. Sometimes this approach can veer towards tasteful or even something a little neutered. However, across Acoustic Motherfuckers 7 tracks, it’s clearly a successful focussing of resources that transports you to the very heart of these songs- revealing inner diamonds in the previously fuzzy squalling working methods. And the results open out immediately with Trembling Voice, Sinking Room in the first few seconds – it’s clear this is a simple, heartfelt and beautiful recording. Instead of the buzzing amplified air, we have gentling twisting voices carving out sun dappled grooves with geometrically enmeshing guitars. Similarly The Light That Breaks Through has the bank of amp fuzz and backwards effects of the original stripped bare. This time it basks in the satisfying strummed mandala of vibrating strings. Whilst it’s easy to think musicians can sometimes hide behind effects, pedals and walls of sonic rubble, it’s evident this pair, even minus electricity, carry a beauty in their music. The heart of these songs are still wonders. Raw music, minus any overdubs, removing any hiding places or artificial forward dynamism. With the thoughtful approach on show here though, it’s a treat to step into the flesh of these passages of sound. After the decaying embers of Dear Papi, the album concludes with something unexpected, locking in Tabata and Junzos acoustic laser beam. The playing with forms ends in the transformation of something the late, great John Peel would definitely love. Dakishmetai is a charming re-imagining of Teenage Kicks with it’s familiar shape twisted around Japanese lyrics and that unmistakable groove. Initial news around Acoustic Motherfuckers had me imaging the impossible form of the abrasive but hugely satisfying forms from acoustic means. My ears had framed a messy avant storm but the album plays out like two friends simply embracing endless new settings for their music. The latest collection, like everything the pair do together and separately is an ongoing fearless journey.